3D printing is all the rage these days, but for now, it’s mostly centered around little plastic doo-dads. The Mink, launching today on the Disrupt NY stage, is a bit different. The little printer lets users choose any color on the web, or in the real world, and using simple already-existing software, print that color into a blush, eye shadow, lip gloss or any other type of makeup. See, most makeup comes from the same basic substrates, from high-end labels like Chanel all the way down to the cheap stuff available at drug stores. 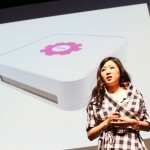 Founder Grace Choi sources the same substrate for the Mink so that users can turn any image into any kind of makeup. The idea here is that consumers are increasingly focused on instant gratification and DIY solutions. Choi also noticed that makeup consumers aren’t always loyal to certain brands, but rather focused on convenience. Moreover, drug stores offer an incredibly limited selection of colors and options. Because makeup isn’t the main driver of sales in a Walgreens, they get more universally loved colors like pinks and reds, and exclude consumers who want to be bold. More niche retailers like Sephora have a wide selection of colors, but at a much higher price. With Mink, users can satisfy the desire for instant gratification while still having access to any color in the world at an affordable price. Simply choose a color on a website, Pinterest board, or snap one with your phone in the real world, and use any color picker to locate the hex code of the color. Once you have the code, you can put it into any other program like Photoshop or Paint and simply press print. The company is targeting the younger, 13-21 demographic who are less ingrained in their habits with certain brands and retailers. The Mink costs less than $200, with plans to launch later in the year. Answer: I have failed a lot of times before. This isn’t my first rodeo. I’m a serial inventor and have been through the manufacturing ring before. I know all the pitfalls. We might fail at some things, but we just need to make sure we don’t fail where it counts. I plan on going to the big guys in printing like Epson to cut a deal, and that should make the process much easier. Q: You talked about how the convenience of mass retailers limits the selection. Is the Mink makeup going to be even less expensive than mass? A: Well, you don’t have to spend any money or resources on actually getting the makeup, and the price per unit is going to be around the same as mass retailers, but with the most color options of any brand in the world. Q: If I understand correctly, you’re planning to sell this to 13 to 21 year old girls, but I might suggest selling it to influencers who will create more of an ecosystem or community around it. A: I absolutely plan on spending time talking to beauty bloggers and influencers, and getting them excited about the product. Once that happens, marketing shouldn’t be difficult. The web itself has so many networks built in already. Q: Can this printer print any kind of makeup? A: The inkjet handles the pigment, and the same raw material substrates can create any type of makeup, from powders to cream to lipstick. Implementing this ability on the Mink is not hard to do, it’s actually more of a business decision.